Darkness was descending, and we were only halfway up the paralysingly steep face of Half Dome, still hours from the safety and comfort of the bivy ledge. A daunting loneliness encroaches when you are drained of energy and cowering under the scything roof that protects the summit of Half Dome, in Yosemite Valley. But it also stirs something from within. Not courage, or anything heroic. It’s driven by necessity, feeding off adrenalin. Light was already fading as Anna, my climbing partner, started up pitch 12 – twin cracks splitting a face in an endless chimney system. She was frightened. She slotted in cams – devices to protect a fall – for every move that she pulled, before slumping on the rope. This was far from the novel scenario I had imagined. It was meant to be a magical night under the stars, relaxed and comfortable on an enormous bivy ledge. We may have been overambitious. After only two climbing days in Yosemite, an area of technical slabs and cracks that is notorious for humbling strong climbers, we had decided to tackle the iconic rock formation that looms invincibly at the head of the valley. I had never spent the night on a big wall, nor dragged a haul bag up a climb, nor used ascenders. So we planned an overnight climb and drove into the valley, full of naive excitement and more than a splash of mild terror. Yosemite captivates on a sublime scale: the granite walls that make the sky seem small, epic waterfalls shrouded in clouds of spray, endless armies of richly textured pine and sequoia forest. El Cap sweeps into view, rising 900m straight out of the valley floor. These holy walls are a mecca for climbers. In the 1950s and 1960s, climbers with heavy hammers and pitons battled their way up intimidating walls, forging into the unknown, etching tales of legend as they moved higher. Half Dome is the most recognisable of Yosemite’s rock jewels. Its inviting, voluptuous outline belie an ominous 600m face of grey, black, and radiant gold. “Try me, if you dare” is how climbing legend Royal Robbins imagined the taunts of Half Dome as he approached the granite giant in 1957, with Mike Sherrick and Jerry Gallwas. It was history’s first big wall. They topped out after four days of courage, tenacity and skill previously unknown in the rock climbing world, forever redefining what was possible. Robbins’ words echoed in my mind as we punched up a steep slab – known as the “death slabs” – to the base. We quickly stumbled onto a steep learning curve; the 11 litres of water in our haul bag seemed a tad overkill when we found a flowing spring a few metres from the start of the climb. We laid down our two ropes as mattresses, and turned in for the night. At first light, leg muscles still stiff with cold and fatigue, I started up a slightly wet crack. At the top, I clipped a pulley to the anchor system and started hauling, using my body weight to pull the bag up a few metres at a time. Repeat. It was an unenviable, life-sapping task. It took longer to bring up the haul bag than to climb the pitch. Just metres into the second pitch, Anna shrieked as she slipped, falling on the smallest of cams. It held firm, arresting her fall. She collected herself and pulled back on. The haul bag became repeatedly caught as she tried to bring it up, forcing me to climb up to free it. A quarter of the way up, the first of the chimney pitches stood guard. Chimneying is a physically demanding, inelegant style of climbing. Often you wedge yourself in with your back against one side, and both feet pushing against the other. Commence wriggling. Chimneys are also difficult to protect, too large for any cam. As I wriggled higher, metres gathered between me and my last cam. Three, four, five metres. The chimney narrowed. I had to frog-leg and press the inside of my knee to the rock to keep me from falling out. A tenuous halo encompassed me, when I suddenly saw a horizontal break in the rock above. Aha! A huge hold, and a good cam placement. Anna started up the next pitch, but exhaustion soon gripped her. I lowered her and we swapped. Running on necessity, I pushed the rope higher, racing sunset, through another tenuous squeeze chimney. I climbed until I was out of rope. By the time Anna followed up, it was dark. “I’ve got bad news,” I told her. “The chimney ate my head torch. It was crunched to pieces on the back of my harness.” But Anna was prepared. She opened the haul bag to reveal two head torches. Hurrah! I attached one and climbed out of the chimneys, traversed to a ledge, then followed a series of cracks that split the next face. Climbing in the dark gives you a special kind of focus, and makes exposure redundant; it’s too dark to see how far and how airy and steep it is to the ground. But it also enhances the chances of going the wrong way. Our arrival at the bivy ledge was delayed when I followed the cracks too high. I had to down-climb and traverse to reach Big Sandy. It was just on 1130pm when Anna joined me. A 17-hour push. We were shattered. Big Sandy offered a number of potential sleeping spots, but the flattest ones were right on the edge of a sheer 400m drop. Anna volunteered for the outside spot. We shared a cigarette, numbing fatigue with nicotine. Harnesses on, we tethered ourselves to the side of the wall, pulling our single sleeping bag over us both. The surface of the rock and the cool air took turns sapping warmth from us. But we were rewarded with a half moon that lit up the valley. Salubrious loneliness is amplified when alone on a big wall, under an infinity of starry sparkles. When first light breached the night, I pulled the sleeping bag over my head and hid from the world. It was too early. My legs were cramping in odd places after squeezing in the chimneys. We had four muesli bars between us, and no idea how long it would take to reach the top. Anna, with minimal words, started setting up for the first zig-zag pitch – the hardest sections of climbing on the route. It started up a thin seam that carved a striking line through arcing, overhanging pillars. As the shadow of Half Dome slowly panned across the valley below, she attached her ascenders to her harness and was soon moving up. After a few hours, we arrived at the Thank God Ledge – a plank of granite perched on the edge of a vertiginous 550m drop to the valley floor. 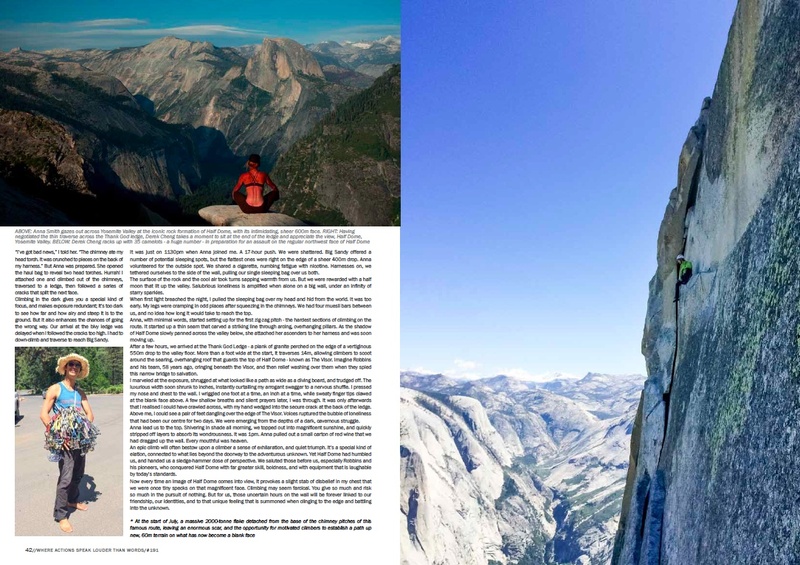 More than a foot wide at the start, it traverses 14m, allowing climbers to scoot around the searing, overhanging roof that guards the top of Half Dome – known as The Visor. Imagine Robbins and his team, 58 years ago, cringing beneath the Visor, and then relief washing over them when they spied this narrow bridge to salvation. I marveled at the exposure, shrugged at what looked like a path as wide as a diving board, and trudged off. The luxurious width soon shrunk to inches, instantly curtailing my arrogant swagger to a nervous shuffle. I pressed my nose and chest to the wall. I wriggled one foot at a time, an inch at a time, while sweaty finger tips clawed at the blank face above. A few shallow breaths and silent prayers later, I was through. It was only afterwards that I realised I could have crawled across, with my hand wedged into the secure crack at the back of the ledge. Above me, I could see a pair of feet dangling over the edge of The Visor. Voices ruptured the bubble of loneliness that had been our centre for two days. We were emerging from the depths of a dark, cavernous struggle. Anna lead us to the top. Shivering in shade all morning, we topped out into magnificent sunshine, and quickly stripped off layers to absorb its wondrousness. It was 1pm. Anna pulled out a small carton of red wine that we had dragged up the wall. Every mouthful was heaven. An epic climb will often bestow upon a climber a sense of exhilaration, and quiet triumph. It’s a special kind of elation, connected to what lies beyond the doorway to the adventurous unknown. Yet Half Dome had humbled us, and handed us a sledge-hammer dose of perspective. We saluted those before us, especially Robbins and his pioneers, who conquered Half Dome with far greater skill, boldness, and with equipment that is laughable by today’s standards. Now every time an image of Half Dome comes into view, it provokes a slight stab of disbelief in my chest that we were once tiny specks on that magnificent face. Climbing may seem farcical. You give so much and risk so much in the pursuit of nothing. But for us, those uncertain hours on the wall will be forever linked to our friendship, our identities, and to that unique feeling that is summoned when clinging to the edge and battling into the unknown. 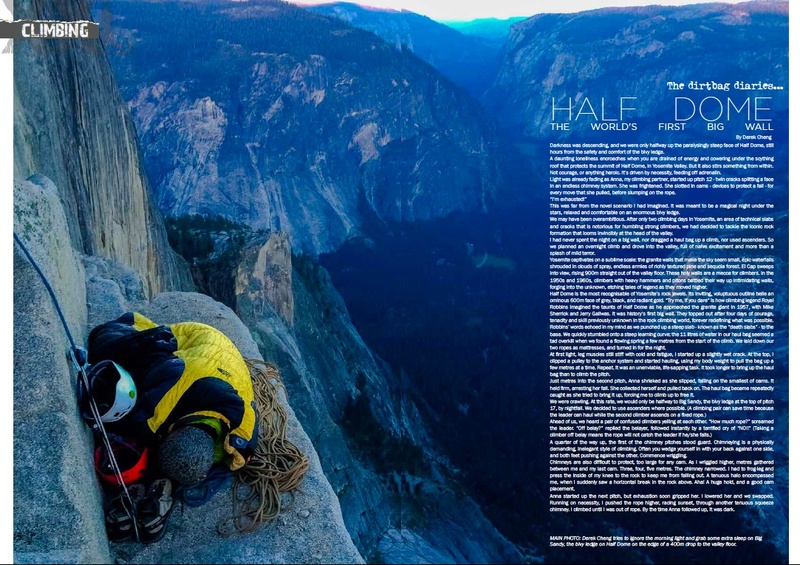 This entry was posted in adventure, climbing, dirtbag dispatches, new zealand adventure magazine, yosemite and tagged big wall climbing, climbing, dirtbag dispatches, half dome, rockclimbing, yosemite. Bookmark the permalink.